Many years ago, a little sapling found itself uprooted out of the pristine environs of cool breezes, ample sunshine, flowing streams, and a beautifully simple life. And it found itself replanted into a whole new environment. One of chaos, hustle-bustle, and a furious pace. In such terms could be described Krishna’s migration from his rural roots amidst the warm embrace of nature, to the big bold city of his expression. While several others might actually have been bogged down by this brutal shift in environment and habitat, Krishna totally exploited his gift of art to marry the influences of his roots and his current existence. 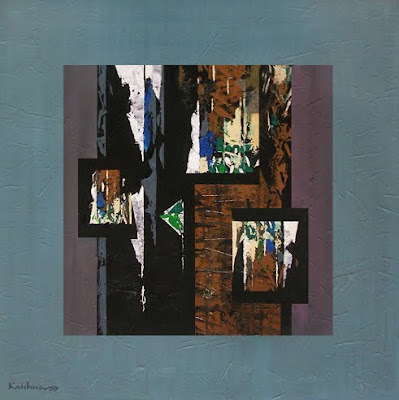 And the world was treated to the immensely delightful paintings of Krishna Pulkundwar! 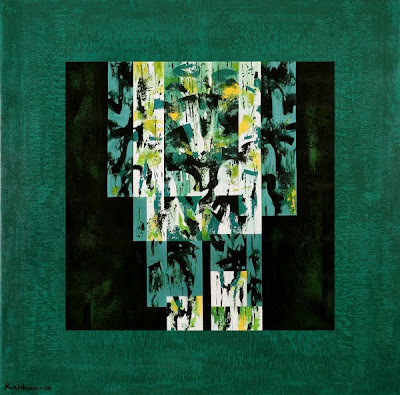 While one might wholly appreciate the acute realism of a landscape painting in the mirror image of God’s creation, the exact stirrings that a beautiful abstract work evokes is something else altogether. I would associate the joy derived out of Krishna’s abstracts to the little inexplicable abstract joys that all of us encounter on an everyday basis. Joys like the sudden blush of an evening sky, the heady feeling that comes with the fragrance of wet earth, the sense of liberation our heart feels on hearing the cuckoo’s call; all abstract expressions, but with very real enrichment of the senses. Quite a bit like taking in the vivid earthy colours, crisp form buildup, and the overall beauty of Krishna’s paintings. Colours form unique colonies, textures breath a new life, and a flat surface discovers new depths in the bold expressions on Krishna’s canvas. And through it all, I’m sure the viewer experiences a whole new manifestation of plain old simple joy! I am an Abstract Painter & Lecturer at J. J. Institute of Applied Art Mumbai. I always wish to express myself through my art and people enjoy my expression. There is a large group of admirers and collectors of my work in India & abroad. I believe, The most simple is the best. 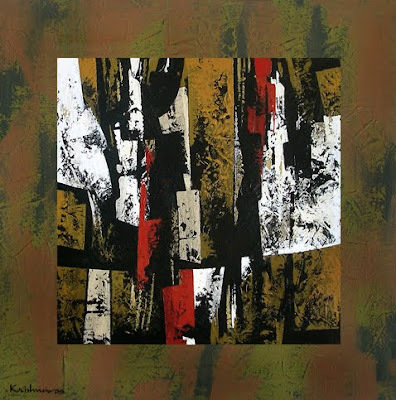 I am from a small village of Maharashtra State, India and now I am in metro city, so the amalgams of nature and city life are mirrored in my work … As a child I loved visiting rivers and was fascinated by the reflection of shallow water, the textures of wood, stones and leaves. These developed into frames of reference and manifest themselves as windows and boxes in my work… As every painting gives me pleasure, so does the medium. Each medium keeps on encouraging me to explore and experiment. All my paintings have given me sublime satisfaction of creation. The feeling of immense joy, which I have experienced, I hope to offer the same to the viewer.